At the start of the year I posted my goals for 2017, as we are halfway through the year I thought I’d follow up on them and post my progress. 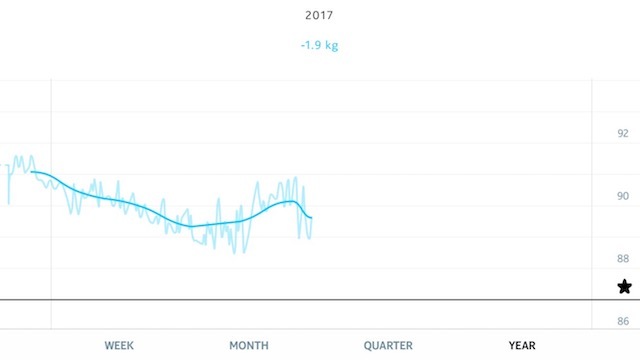 My weight has been under 90kg for most of 2017 so far, I actually reset my goal to 87kg. However we went on holiday to Croyde and too much holiday food was enjoyed, so I crept back over 90kg, but I am back under now and still aiming for under 87kg. I’ve failed on this one so far, I did a track session at Silverstone, but since then I haven’t done much with it. It really needs a suspension refresh, so I am a bit reluctant to go on track before that is done. I will see what happens over the next few months though. Most of my riding has been local so far in 2017, with only a couple of trail centre visits. 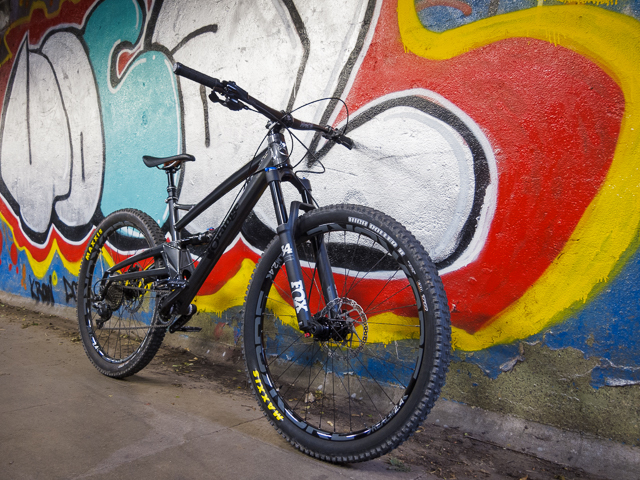 I went to the Leisure Lakes Demo Day at Cannock Chase in March, I also took my new bike there last weekend. I have got plans to ride at Llandegla trail centre in Wales in a few weeks time, so not too worried about missing this goal. What I have rediscovered this year is cross country riding on unknown trails, I had a really good ride from my Mum and Dad’s house, exploring the Cotswolds and tried out a fairly local route, which in future I may build into a longer ride from home. Riding on natural terrain on bridleways has opened up a whole new area of mountain biking for me, one which I should be delving into more over the coming months. Not yet! Although I’m pretty sure I could have done it last weekend, except I was running late. My excuse is that Owen slept in and didn’t wake me up. I’m sure I’ll get back to Cannock later in the year and complete the loop. I have been taking my pocket camera – a Canon S90, with me on my bike recently. I am interested to see how photos from the old camera compare to my iPhone 7, which I will probably go into on a future blog post. I still have plenty of time left to get out with my DSLR though, ideally early one morning for some landscape photography. I’m going to claim a partial success on this one! I went for a yoga class with Jean a couple of weeks ago, and have been doing some yoga most days since. I just need to keep it going! I have also found an interesting yoga series on Pinkbike, one of the biggest mountain bike websites, so I intend to work through some of those exercises. Overall I think I’m pretty much on track, with the exception of actually getting my MR2 out on track! The main thing is that I am doing well on the fitness ones, which are usually the new year goals that go out of the window first. Despite the title of this post, I didn’t go back to work on Monday morning. I had booked Monday and Tuesday off work as annual leave, due to Owen’s birthday being on the Tuesday and wanting to wait until after his birthday to return to work. This because the parental leave allocation is 52 weeks, rather than a full year. I was determined to go for a drive in the MR2 on our last day off together, even if it was raining. We drove down to Chipping Norton, with the roof up, to see my Mum and Dad. Owen had a huge lunch, then a long nap, fortunately we’d left his travel cot there from his sleepover last week. He really seems to feel at home at my Mum and Dad’s house, crawling everywhere like he owns the place! I didn’t get the roof down blast in the MR2 I’d hoped for, but we both had a good day out. 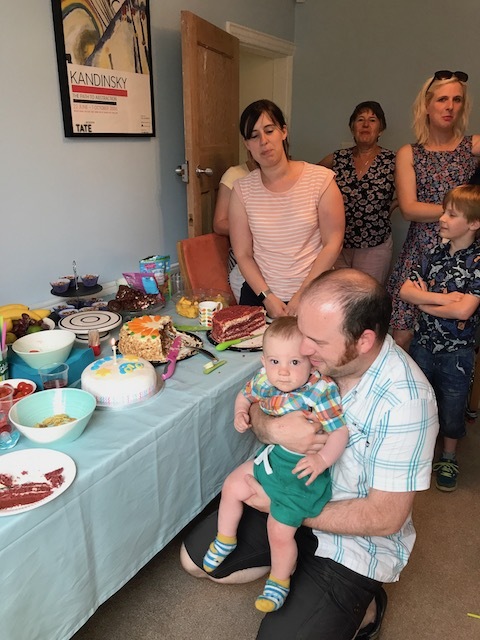 Tuesday was Owen’s birthday, I’m not sure he knew exactly what was going on, but did seem to like all the presents – he is a very lucky little boy! Later in the morning we met my Mum and Dad at the Transport Museum. I’m not sure that Owen was as interested in the old cars as I was though. We all had a big lunch at home with Jen’s Mum and sister too, then Owen’s birthday cake. After the cake my family left and more of Jen’s family arrived – with more presents (and cake). It was a busy day, but Owen seemed to enjoy himself, which is the main thing. Wednesday was also a big day – Owen had his first full day at nursery and I was back to work. Owen had obviously recognised the nursery from his settling in session last week, as he started crying as soon as we walked through the door. Probably realising that we were going to abandon him. It was hard leaving him, especialy as he was so upset, but I had to get to work. Sitting back at my desk felt natural – I’m not sure if that is a good thing or a bad thing. The only indication that I had been off for two months was a bulging inbox, which I spent most of the day sorting through. When Jen picked Owen up from nursery we were told that he’d been fine most of the day, and had enjoyed playing with the sit in toy car they have there. Hopefully over the next few Wednesdays he will begin to realise that nursery is actually a fun place and not get quite so upset when we drop him off. I was back at work on Thursday, but it was Jen’s day off to look after Owen. They went swimming, then to buggy workout – which sounded better than being stuck in an office all day! In the new regime Fridays are my day off to look after Owen, so at least I only had two days in the office this week. Our day wasn’t as exciting as Thursday – I think Owen must have picked up a cold at nursery, he had a runny nose and didn’t seem to be his usual cheeky self. So we mostly hung out at home, playing with Owen’s birthday presents. We did have one trip out, to the supermarket where Owen was his usual cute self, gaining even more admirers. We had a relativly quiet weekend, as none of us were feeling 100% – I guess this is how things will be now that Owen is going to nursery. Jen still felt well enough to do Parkrun, so Owen and I went to the park to cheer her on and have a play in the sandpit. We spent the rest of the morning in town, grabbing lunch at the food festival. Owen had a taste of my chimichanga and Jen’s paneer wrap, seeming to like both. 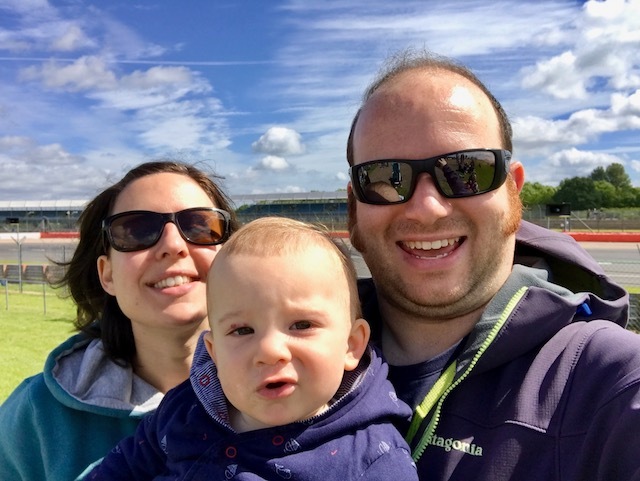 Sunday was another important day in Owen’s childhood – his first trip to a racetrack! We went to the British GT/Formula 3 meeting at Silverstone, as part of the Pistonhead Sunday Service. Owen did have a look at all the cars, but equally enjoyed having breakfast in the paddock cafe and crawling around on the grass banking on the inside of Copse corner. We spent the afternoon back at home in the garden, Jen cracked on with jobs, whilst I played with Owen. Even though we had brought his toys out with us, Owen was most interested in playing with the fresh topsoil I’d put down, mostly trying to eat it. He was filthy when we finished, but he’d had a fun afternoon! As my parental leave has finished and I’m now back at work, I will bring this series of blogs to an end. I feel like I have gained a lot from spending all of this quality time with Owen. I certainly feel much more in tune with him than in week 1 – when I was impressed that he could go from his belly to sitting up. Now he is trying to climb anything that he can reach and crawls behind me when I move from room to room. Hopefully Owen has benefitted from having his Dad around, I can tell that he has enjoyed it. I did miss Owen the two days I was back in the office, so I am glad that I will be having Fridays off to look after him, which I am sure will be the highlight of my week. As it was Owen’s first birthday this week I thought I would throwback to the 8th of June last year, when he was only a few days old and still in hospital. Look how small he is! These days he’d be standing on my legs and either trying to climb over my shoulder, or stealing my glasses. We both had a lie in on Tuesday! The first one in almost a year! Jen had the day off, as it was an extra holiday for civil servants and I didn’t have Owen to wake me up. We were just about up and about when the builders arrived to continue work on the garden – in our defence they did get here earlier than expected. What did we do with our new found freedom? We cleaned. We cleaned the house from top to bottom, sorted out the clothes that Owen has grown out of and, after 4 years living here, I finally hung some photos on my office walls (mainly to get them off the floor so I could vacuum). Who says that having children changes people? Owen got home late morning, having enjoyed his Cotswold mini break with his grandma, grandpa and great auntie by all accounts. I was relieved that he seemed happy to see Jen and I when he got back though. We had an indoor picnic, which Owen enjoyed, as from his little chair he could drop his food on the floor, then pick it up again (and repeat…). In the afternoon we had some errands to run, collecting the last few bits for Owen going to nursery. Jen took Owen shopping with her, which I think he found a bit boring as he did a lot of screaming. I got my bits done quickly so I could get out on my bike. As Jen was off work the evening was relaxed, we both had a good play with Owen. We had chilli for dinner and, as seems to be the way these days, Owen wanted to try it. He seemed to like it, as he kept coming back for more! Owen woke me up at 4:30 on Wednesday morning, but I didn’t hear from him again until after Jen’s alarm clock had gone off! Naturally, Owen’s lie in coincided with him needing to be at nursery for the first of his settling in sessions at 9:00. I can tell that he will be trouble as a teenager, he seems to have inherited my sense of urgency for this sort of thing. He seemed happy to be back at nursery, until he realised that Jen and I wouldn’t be staying with him this time. He had a bit of a cry, but we were told that he was fine almost straight away. Whilst Owen was busy exploring his new surroundings, playing with toy cars and throwing balls out of the ball pit, what did I do? More cleaning, this time in the kitchen. Owen was asleep when I collected him from nursery, so he wasn’t too impressed at being woken up and had a little cry. He was happy enough by the time we got home. After his lunch I continued his Scottish food training with some Tunnocks Teacake, which went down very well! When Owen woke up after his nap, we had a frustrating afternoon, with Owen doing a lot of screaming. If he was in his high chair, I tried leaving the room for a bit and waiting for him to calm down. He seems to be getting the message, as he calms down much quicker now, but it is still frustrating. I think it will get easier when he can articulate his frustrations. When Jen got back from work we all had quick dinners, then I went climbing, at the new climbing wall in the city centre. On Thursday morning I risked letting Owen feed himself Nutella on toast, it didn’t turn out to be the chocolate coated disaster I was kind of expecting. Owen didn’t even finish it, possibly because he’d scavenged too much of our breakfasts. There was no swimming, due to the school holidays, so I gave Owen a bath, so he could still have his Thursday morning splash. This must have tired him out, as he had a long nap, allowing me to crack on with some jobs. Jen had the afternoon off to go to buggy workout, so I took the opportunity to get out on my bike. Saturday was Owen’s first birthday party! We started the day off with a trip to Costco to get supplies. Owen was his usual cute self and had people fussing over him. He was absolutely in his element being wheeled around the shop, especially as they were doing tastings of his two favourite foods – avocado on toast and cake! Owen seemed a bit confused when people started arriving for the party, he wasn’t used to seeing so many people at home, but he was soon crawling around seeing everyone. All the fuss must have tired him out, as he needed to have a nap – skillfully avoiding the bit of the party where both his girlfriends were there! After his nap we sang happy birthday to him, which he didn’t seem too bothered by, but certainly looked like he enjoyed the cake that Jen had made him! Towards the end of the party all of the remaining children (aged 9 months to 7 years) gathered in the tent on the lawn – it was good to see them all playing together so nicely. Some of our friends had travelled down from York with their children for the party, so we spent the rest of evening with them, visiting the city centre to catch the end of Motofest, then having a takeaway. Owen seemed much happier with a smaller group and stayed up with us well past his usual bedtime. After a busy week and getting up at 6:00 with Owen everyday I was glad to have a Sunday lie-in! I also got out on my bike again, taking my total distance for the week over 90km! After playing with the older children at his party, Owen has gained confidence, he is exploring around the house and climbing more, this has meant a few knocks, but it is interesting to see. 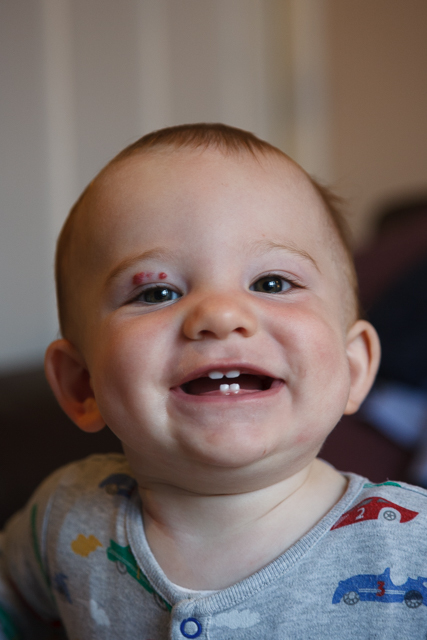 While he was crying after one of his falls I spotted that he’s now got a fifth tooth! As Jen had over-catered for the party, we all had party food leftovers for lunch. I think the fact that we were all eating the same things made Owen try a few new foods, although some of them ended up on the floor. We had planned to go back into town for Motofest in the afternoon, but it was raining, so we all ended up having naps. It was good to have a day of doing nothing, it is so rare for us. 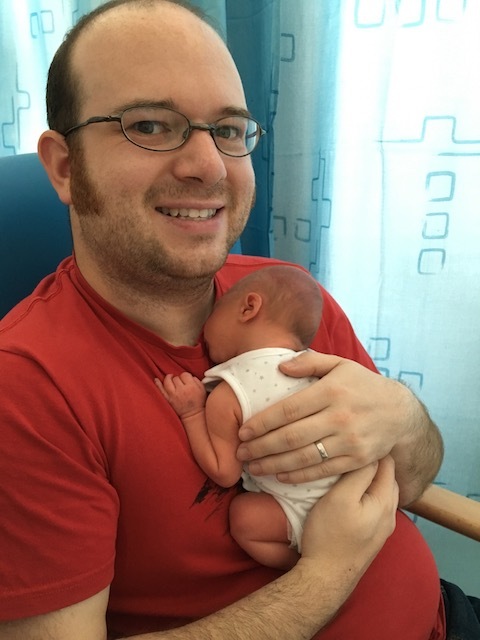 This is now my paternity leave over, I’m not quite back to work yet though, so I’ll be concluding this series of posts next week. After painting the veranda the next phase of the project was replacing the old paving with sandstone. In addition to replacing the old patio and path, we wanted to add a second patio at the opposite end of the lawn, to be in the shade when the veranda is in the sun and vice versa. This meant losing some lawn, but I think the extra patio space is worth it. We also took a bit of lawn and veg plot to add a border to the sandstone path, which really sets of the sandstone paving. There are some jobs best left to the professionals, and in my option hard landscaping is one of them. We used PR Fencing, who had done a great job of our fences three years ago. Although they are a predominatnly a fencing company, they also do landscaping and are great to work with. They replaced the veranda a few weeks ago, then fitted the roof alongside the landscaping work. All I had to do was make lots of drinks and make a few key decisions. 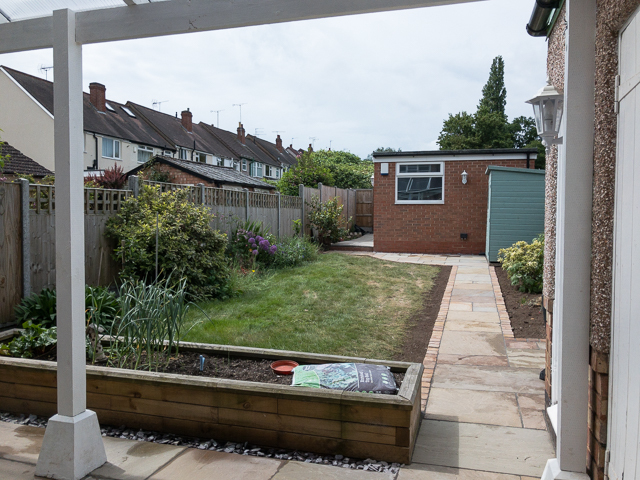 We are really pleased with how it looks, the path looks so much neater and the veranda looks much more solid. We still have a few more jobs to do, sorting out seating and planting. The lawn took a battering, so I will need to sort that out, as well as seeding the bits next to the new paths. The decorative parts of the veranda have not been refitted, mainly as we still need to refurbish them. So we are still going to have a busy summer working on the garden. I was reminded earlier that it is three years since the garage build started, the garden has changed beyond recognition since then, which reminds me just how far we have come with the 119 project.